A petrol pump near you may hold clue to this year's election results. The UPA lost the 2014 elections, slipping on petrol prices. Five years later, the NDA finds itself in a similar spot. Petrol prices rose sharply in the last two years of the UPA government similar to what is being seen in the last two years of the NDA regime. In Mumbai, petrol prices hit Rs 78.57 a litre in May 2012 and then hit a peak at Rs 83.62 in September 2013. Though there were many other factors riding against the UPA in 2014, including a Modi wave, the coalition's inability to control fuel prices was a key trigger. The NDA finds itself in a similar situation now. Petrol prices in Mumbai stood at Rs 79.99 (on October 3) in 2017, in 2018, it broke all records reaching lifetime high level of Rs 91.34 a litre on October 4. "The comparison of petrol and diesel prices during UPA and NDA government's tenure should not only be done by taking the retail rates. Prices should also be seen in the light of policies adopted by governments to minimise the impact on consumers. It is here that effort of the NDA government seems lacking," an official was quoted as saying in an IANS report. Contrast this with oil situation during NDA government's tenure and it becomes clear that the government has remained focused on maintaining its revenue stream through higher excise duty on petrol and diesel. 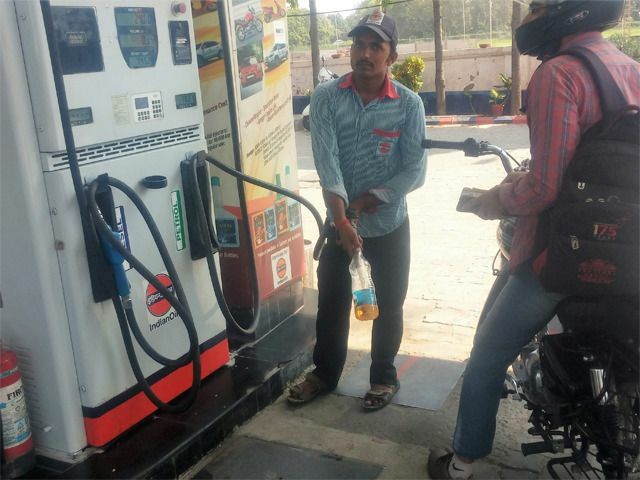 Duty on the two petroleum products were only reduced last October by Rs 1.50 a litre when petrol prices in Mumbai were threatening to breach Rs 100 a litre mark. The NDA government raised excise duty on petrol and diesel on nine occasions between November 2014 and January 2016 increasing its excise collections from mere Rs 99,184 crore in FY 15 to Rs 2,42,691 crore on FY17 and almost similar collections in FY 18. It reduced the duty only twice in October of 2017 and 2018. If oil's not pinching you yet, it's because the veiled price control has already made its comeback. Between January 1 and now, there have been 10 instances when retail prices of petrol and 12 occasions when diesel prices have been left unchanged by OMCs - between two days at a stretch to a week. Since February 9, there has been a consistent increase in the retail price of the two petroleum products on global cues, but OMCs have held back any increase on six occasions, the longest being for four days between March 5 -8. Though state-owned oil companies are restricting price rise by absorbing a portion of the hike, things may become difficult if the current momentum in global oil price is maintained for the next couple of months.